Any agitation for skywalks and pedestrian subways can never be termed unjustified. In fact, there is urgent need to migrate from motorist-centric to pedestrian-oriented policies. Every widening of road is done at the expense of the footpath, thereby forcing more and more people to walk on the road and become victims of accidents. Every signal-free corridor is an antithesis to the right to life of those wanting to cross the road safely. But shouldn’t the citizens walk the talk first, by starting to use the dozens of skywalks and subways which already exist? Skywalks at Sheshadri road, Residency road, Chalukya circle, Old airport road, KG road, Peenya and subways on the national highway are lying unused for decades. Once erected, overhead footbridges are condemned on the grounds of being unfriendly towards elders, the disabled and pregnant women. By the way, how do the same people cross railway platforms? There they have no option to run across the railway line like they do across the roads. In reality, even able-bodied young people don’t use them! Even after provision of lifts and escalators, the safety of single women during odd hours are raised as an excuse for non-usage. Moreover, how long will such lifts and escalators survive instances of vandalism and thefts, considering that street lights, traffic signage and even taps are damaged or stolen from public places overnight? Our dismal track record of maintenance of public utilities does not instill confidence about the feasibilities of lifts and escalators on the roadside. Underpasses take years to be completed, after which even these suffer non-utilisation on the grounds of lack of maintenance and safety. Without disputing these issues, the point is that leaving them unused is not really the solution. Infrastructure, if unused, becomes a breeding ground for criminal activity and garbage disposal. On the contrary, more utilisation is likely to make them safer and better maintained. No doubt, the solutions provided here are far from perfect, but is it fair to look for perfect solutions in an otherwise imperfect society? For those who are reluctant to climb up the skywalk or get into a subway, walking to the next traffic signal or pelican light and use the zebra crossing is the safest option. 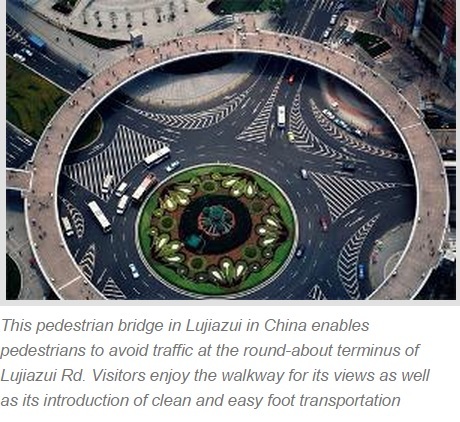 But how many people would walk a hundred meters to cross a sixty feet wide road? People need to walk to traffic lights and cross the road instead of crossing (read jaywalking) wherever they wish to. The onus also lies on the pedestrians to cross the road at the appropriate place. For many officials, the best way to avoid controversies is to do nothing. As a result, pedestrians continue to die while crossing the road. Worldwide, there are only three ways of crossing a road….climb up and then down; climb down and then up; or walk to the nearest signal. We are no exception. Can we make a beginning by creating and using skywalks, underpasses, escalators and pelican lights etc, without debating endlessly. Let safety take precedence over convenience, for once. Every completed skywalk or subway reminds me of a story where a boy insists on eating a lizard. His parents, sister, grandparents try in vain to divert his mind off the lizard but the boy persists. The family turns towards their guru to try and put some sense into the boy, but he too fails. Finally the guru orders the lizard be brought on a plate for the boy. The boy refuses to eat the lizard, saying that he wants to eat a fried lizard. So the lizard is fried. Then the boy insists that the guru should eat a portion of the lizard to confirm that the lizard is fully fried. The guru somehow manages to swallow a piece… Immediately, the boy starts crying, “guruji ate the piece that I wanted to eat”. The guru runs away before he is made to eat anything more and the boy never eats the lizard. Unfortunately, this is the story of all existing skywalks and subways!